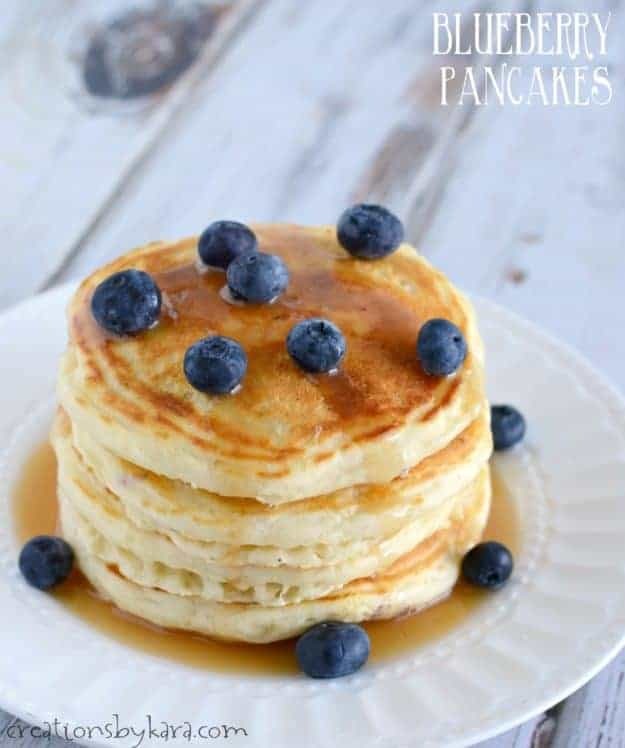 This Blueberry Pancakes recipe is so easy to whip up, and it makes soft and fluffy pancakes that are hard to beat! We have a tradition at our house of having hot homemade breakfasts on Saturday mornings. My kids LOVE pancakes, so that is usually what they request. 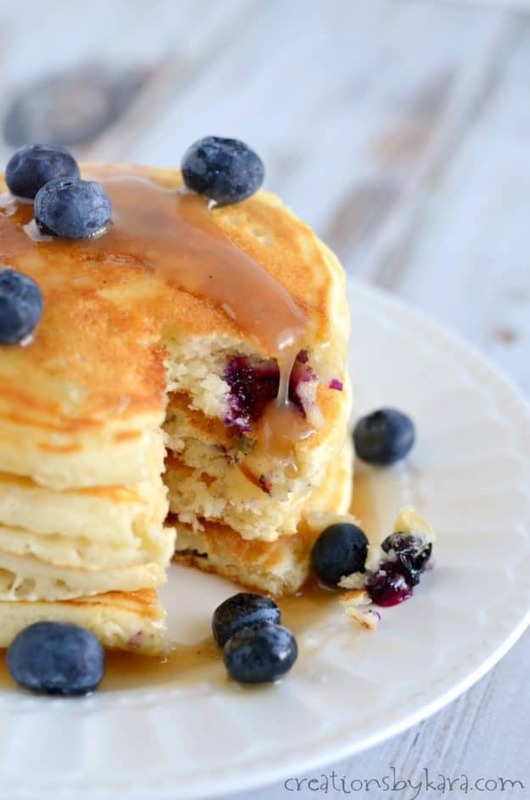 These blueberry pancakes are out of this world, and a new personal favorite! So tender and flavorful. Can I use frozen blueberries for pancakes? 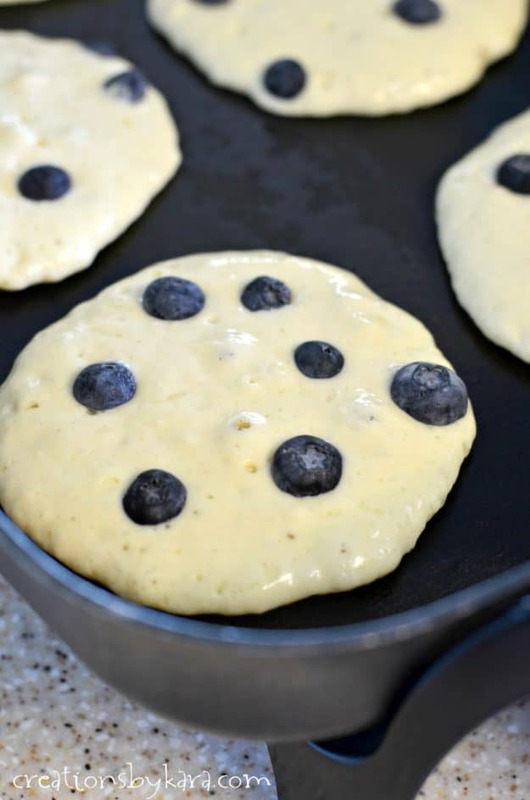 I love baking with fresh blueberries, but they usually cost a fortune here in Utah, so I frequently use frozen berries in my pancakes, and they work just fine. If using frozen berries, you definitely don’t want to stir them into the batter, use the method below. I happened to find some fresh blueberries on sale, so I used them for these pancakes. I added extra fresh berries to the top of the pancakes, and it was fantastic! I love the tartness of the berries with the sweetness of the syrup. 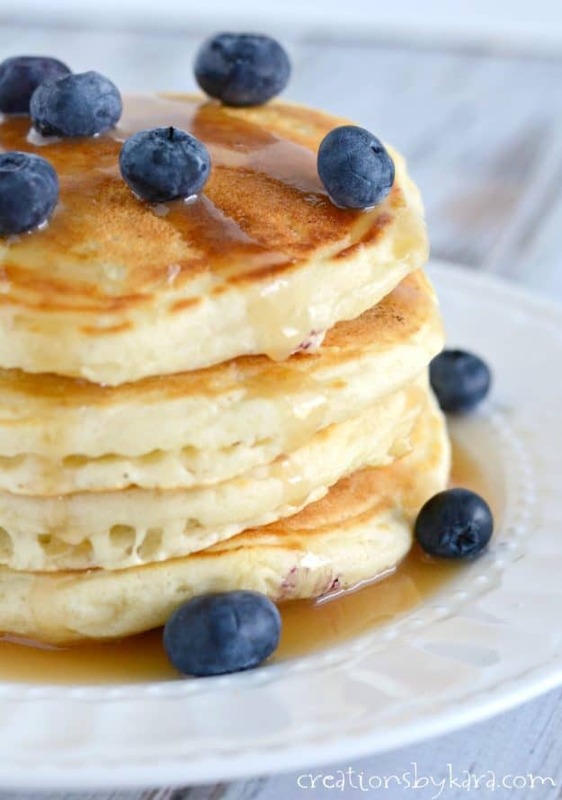 How do you add blueberries to pancakes? Instead of adding my blueberries to the batter, I like to sprinkle them on top of the batter on the griddle. The pancakes turn out much prettier that way, and it’s easier to evenly distribute them. 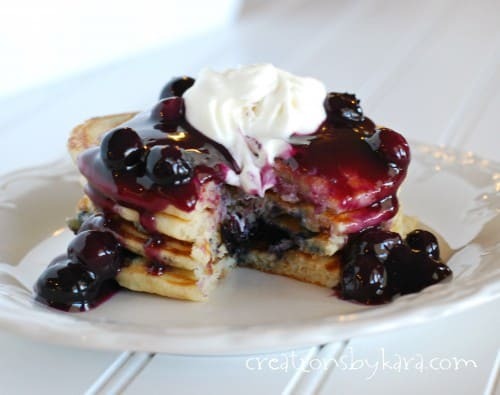 We are huge fans of buttermilk syrup, and I think it takes these blueberry pancakes over the top. Seriously, you must try it! With the warm buttermilk syrup and the fresh berries on top, you will feel like you are eating breakfast at a fancy restaurant! 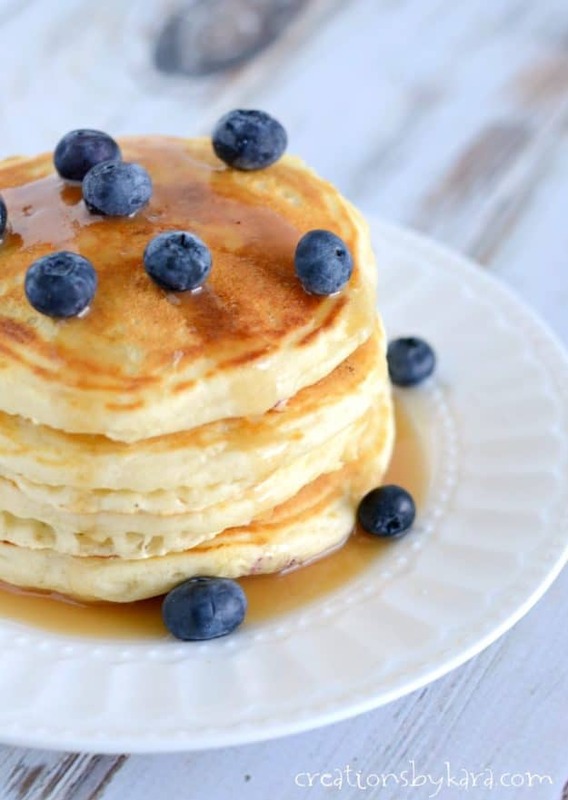 Light and fluffy pancakes filled with juicy blueberries. Whisk together the flour, sugar, baking powder, and salt in a mixing bowl, preferably one with a pourable spout. In another bowl, whisk together the milk, eggs, melted butter, and vanilla. Add to the dry ingredients and stir lightly. Don't over-mix or the pancakes will be tough. Spoon batter onto a medium hot griddle, and sprinkle blueberries over the batter. Cook till bubbles form, then flip pancakes over and cook till golden brown. Serve hot with syrup. For all my breakfast recipes, click HERE. 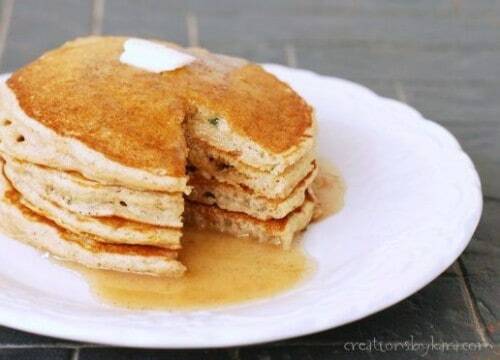 I love a thicker pancake and these do not disappoint! This would be fabulous as a cobbler topping. I too sprinkle the blueberries on top of the pancake as it’s cooking for even distribution and so it doesn’t darken the batter. We used thinned lemon curd on top as syrup. We are in love with the flavor combo. The only change I made was used salted butter and .50 tsp of salt. It was the perfect balance of salty and sweet. Thank you! This one will be in our regular rotation for hot Saturday breakfasts! I love the idea of serving them with thinned lemon curd. Yum! These are okay. Salty, too fluffy, thick, and hard… despite my light/soft stirring. I will not make these again. Do you really add 2 Tablespoons of Baking Powder? That seems like alot? Maybe it was meant to be teaspoons. I’m so happy I found this recipe! I made this for my family Christmas Brunch we have every year, and I couldn’t keep up with the demand! They were a hit and SOOOO FLUFFY!!!!! For some reason, my initial batter was really thick, so I added an extra 3/4 cup of milk. Regardless, this is my new favorite!!!! Thank you so much for sharing with the world! Yay, glad to hear you loved them Taya! Super yummy! Light and fluffy. I love lemon and blueberry together, so I’ll have to try that next time. Yum! 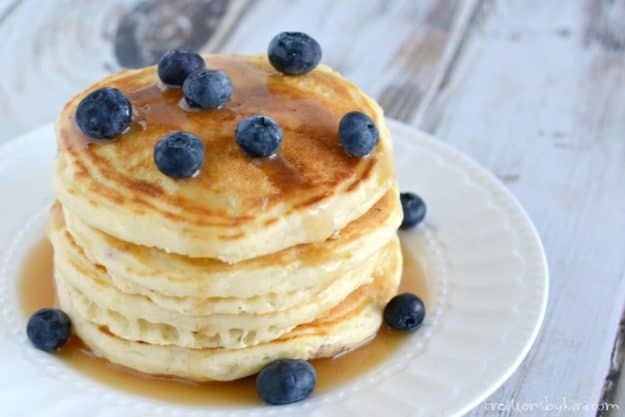 Your receipe is just amazing, first time in my life I was cooking pancakes and I had high expectations as I spent a couple of holiday in the US and had great memories of the delicious pancakes I have eaten there. I am French and I am currenltly travelling in Transylvania, Romania in a van and they sell delicious fresh blueberries for nothing here! So my boyfriend and I decided to bake some blueberry pancakes (my dream! ), I found your receipe online and appeared to have all the ingredients on board, so this morning I baked the best blueberry pancakes I have evere eaten, with the buttermilk syrup that I made with a sort of creamy yogurt that I found here. How fun that you are trying new recipes while travelling. I love having yummy memories from the places I have visited. I’m so glad they turned out for you!! Pancakes turned out surprisingly perfect! I’m surprised because my batter was very thick. Looking at the pictures and the directions to “pour” not scoop lol so I would say something is wrong. I just don’t know what. I followed the recipe exactly…. Did anyone else have this issue? Maybe my eggs were too small? These were the best pancakes I think I have ever made! Thanks for the great recipe. Can extra batter be saved for a day or so, or should I just cook and reheat the pancakes? Thank you! I like to cook them all at once and then reheat them. At my house, we sometimes just pop them in the toaster! So glad you liked them Alison! 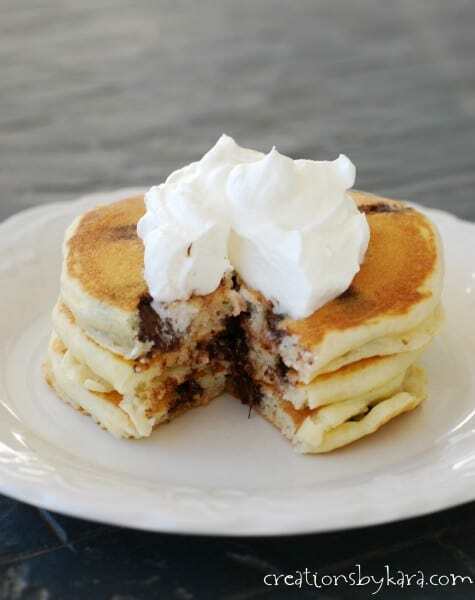 Just made these this morning and they are really fluffy and good! Thank you!! I’m with you Molly, I love trying new pancake recipes. This one was definitely a winner at our house!